More science cookie fun! 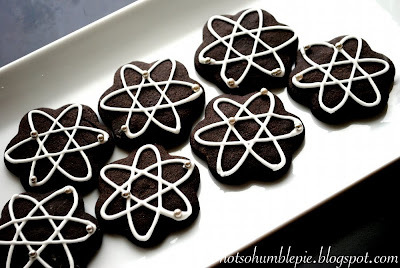 Atom cookies! Ok, before the physics/chemistry folks remind me that atoms don't actually look like that, let me remind everyone that modeling the three dimensional probability cloud of an electron with frosting just isn't going to happen in my kitchen. Sorry! Ms. Humble is taking some artistic license here. Obviously I didn't even including a nucleus with these. Well, I did for some but the cookies just looked far more interesting uncluttered by a nucleus. Besides, I wanted to use silver dragees for electrons, so I had to define an absolute location for them. I just tossed out all that electron 'wave' nonsense. That's right, I can do that. No probability distribution for me, I know where those electrons are. They're right there on my cookies. So we're using Martha Stewart's Chocolate Cut Out Cookie recipe for this (link), even though I admit I am not a huge fan of this cookie's somewhat boring flavor. Maybe I just expect too much from a chocolate cookie. Perhaps a kind, fellow baker will point me in the direction of a really tasty chocolate cookie cutout recipe sometime...maybe? I would really appreciate it. 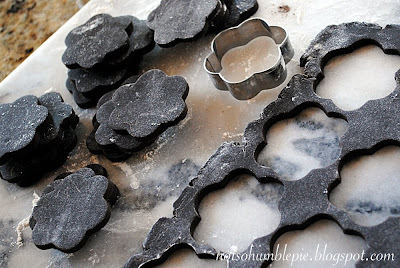 So for these cookies I used a simple flower cookie cutter to cut the shape, one that would allow for several electron orbitals on it. This one fits three, what does that make it... lithium? Anyway, then I just piped overlapping ellipses on the cookie with royal icing and placed a silver dragee on each orbit. Very simple science themed cookies. This one is kind of scary, it has 2 bonded electrons on the same orbital... is that dangerous? I even used gold and rose colored dragees to differentiate between the protons and neutrons. I hope that pleases everyone. I think I would call the nitrogen instead of lithium, since all the electrons appear to be in similar orbits (i.e. 2p electrons (the orbits even kind of look like perpendicular p orbitals)). Since you've left out the neuclius, may as well leave out the core electron shells as well. Your bonded electron sample would then be an oxygen atom. According to the electron cloud model, there's no problem with electrons (of opposite spin) occupying the same location. Thank you, James! In continuing the science cookie trend, I admit I am stepping a little onside of my field, so it is good to know that my blog is being peer reviewed! Where oh where are the nuclei? Maybe cinnamon red-hots would do the trick? I ♥ your cookies Ms. Humble. They entertain me so much. I would NEVER eat one if I was lucky enough to be given it - they are works of art! Amazing! My elements-crazy 7yo son is going to love these! May I please link to you on my blog roll? Need all the kitchen science project ideas I can get (grin). Thank you Mr. P and Suji. Of course you can add me to your blogroll, Suji. I'd love that. These are the best comments. Just when I think your science cookies can't get any better! These are my favourites by far! So beautiful in there simplicity, I *love* them! I saw these on Photograzing...they are silly and cute and wonderful! I'm going to have to add you to my list so I can tour your site...what else do you have hidden around here? ;) Thanks! May I just say that discovering your blog has just made my life immesurably better? I'm a science geek working on my master's (former life in biochem, current in genetics) and this makes looming finals so much sweeter (probably literally). Thank you for sharing your cookies to the joy of the science geeky world. These cookies are all fabulous! You use royal icing a lot, and I was wondering if you used old fashioned royal icing with egg whites or newfangled royal icing with meringue powder? I'm a meringue powder fan. I love this. I love this so much. I think it would be difficult to overstate how much I love this. I made a chocolate Halloween house complete with stained glass windows using the Cookie Craft recipe. (And I've got a link to the book too). Thanks Wendy! I'll definitely check that out. I think I might be in love with you. Not in a creepy-stalker way, more an internet-fandom way. But love, nevertheless. How ridiculously cute! Love it! I think that would be a perfect holiday gift for my coworkers in the lab! I'd better get baking! Hah! I love these! And I definitely vote for three-dimensional diagrams of hybrid orbitals. This is so cute! I am glad that I found your blog through Tiffany's The National Cookie Network. Everything you have here looks really pretty! While I am neither as creative nor as good with royal icing as you, I am good at concocting cookie recipes, and I have a new chocolate cut out recipe, if you'd like to try it. ...I really don't know what they were thinking in that recipe. Cinnamon and chocolate? Blech. 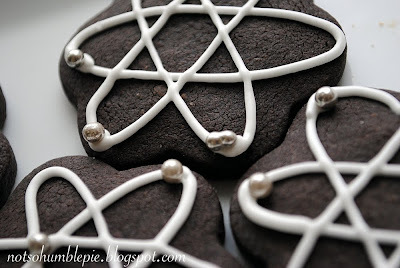 Why is there a six-pointed star on every cookie? Proof that the Rutherford atomic model and your cookies are just another part of the Greater Zionist Conspiracy. I was looking for some tips on price and recommendations of Cialis Online, but as I love cookies I could not let pass your post, they are beautiful and I bet they are tasty. "I just tossed out all that electron 'wave' nonsense. That's right, I can do that." I'm just your typical nerdy biological anthropologist turned stay at home mom and baker of sometimes strange goodies.